South Sudanese refugee child next to a fantasy pair of slippers he drew, in a Bidibidi refugee settlement, in Uganda. According to the UN mission there, some 125 women and girls sought treatment after being sexually assaulted - horrific acts that are a “distressing reminder” of how, despite recent recommitments by the country’s leaders to stop fighting, the security situation for civilians remains dire, Mr. Guterres said. More than 2.2 million South Sudanese are now refugees in six neighbouring countries - Uganda, Sudan, Ethiopia, Kenya, the Democratic Republic of the Congo (DRC) and Central African Republic (CAR) – and another 1.9 million have been uprooted from their homes inside their country. 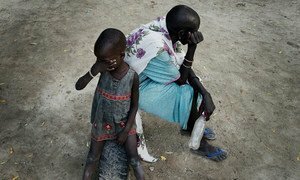 Widespread and systematic sexual violence across South Sudan, just a few months after the country’s top two politicians signed a renewed commitment to peace, was at the top of the UN Commission on Human Rights in the country’s agenda on Friday, as members ended their first fact-finding mission. 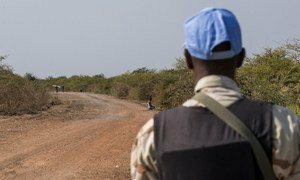 Senior United Nations officials, including Secretary-General António Guterres have condemned a series of brutal sexual assaults on women and girls, travelling on the road to Bentiu, a town in the north of South Sudan.